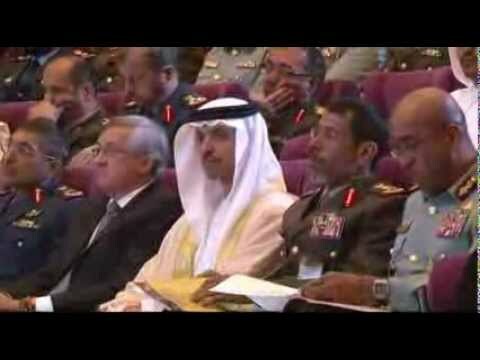 Abu Dhabi, Saturday 19th February 2011: His Highness Sheikh Hazza bin Zayed Al Nahyan, National Security Advisor and Vice Chairman of the Abu Dhabi Executive Council, inaugurated the Gulf Defence Conference (GDC) at the Abu Dhabi Armed Forces Officers Club. 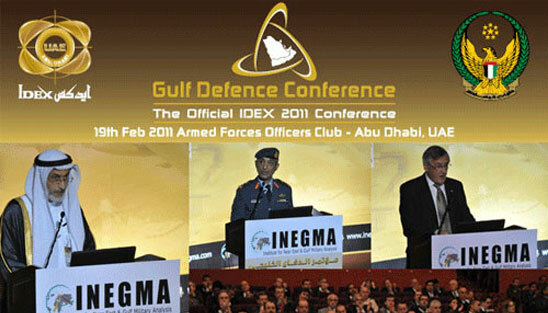 Held under the patronage of His Highness Sheikh Khalifa Bin Zayed al Nayhan, and organized by the Institute for Near East & Gulf Military Analysis (INEGMA) on behalf of the Abu Dhabi National Exhibition Center, the GDC is the official conference of IDEX – the Middle East & North Africa region's largest tri-service defence show. 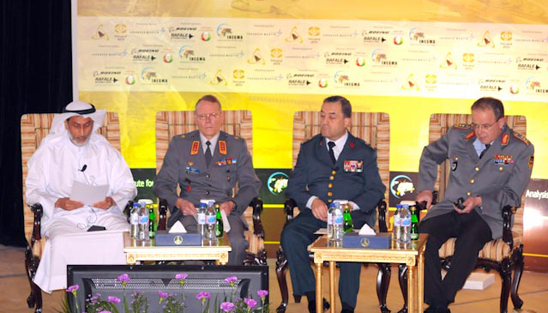 This year, the Gulf Defence Conference addressed emerging threats and novel technologies involved in GCC defence and security industry, through a series of plenary sessions and keynotes delivered by industry experts and leading political figures. 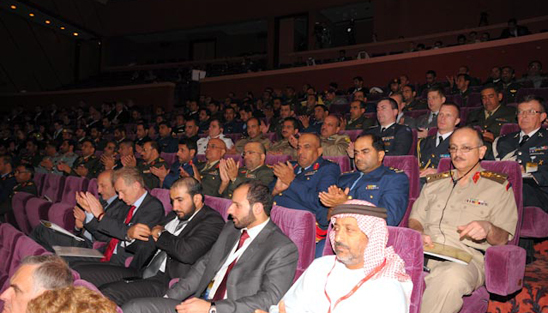 GDC saw record participation with more than 400 delegates in attendance including members of the official delegations visiting IDEX 2011, senior military officials, and key industry partners from across the GCC. 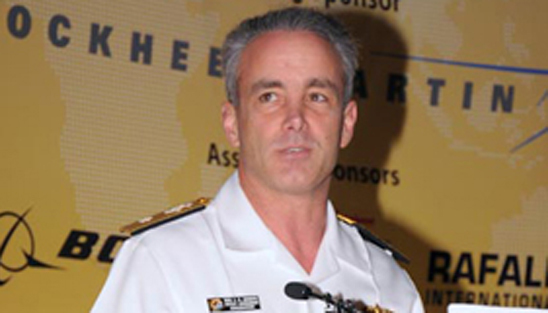 10:25 – 10:50 "Future Challenges for Land Forces"
Major General (Ret.) 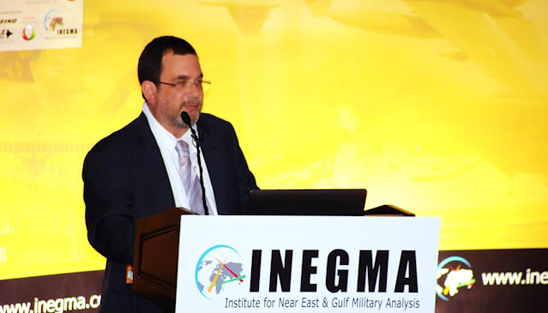 Khaled Abdullah Al Bu-Ainnain, President of INEGMA welcomed the conference attendees and highlighted INEGMA's goals in organizing events such as the GDC: "We are meeting our friends and allies to share ideas and views on how we overcome the threats of today. 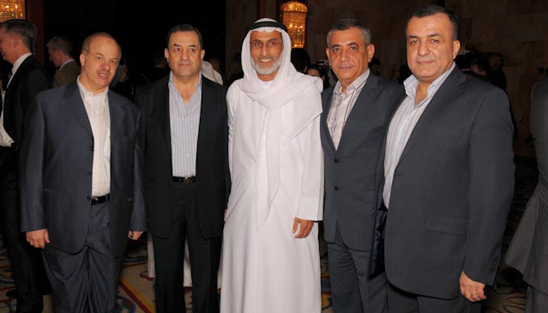 Modern nations with booming economies like the UAE must be sure their militaries are modern and well maintained ... 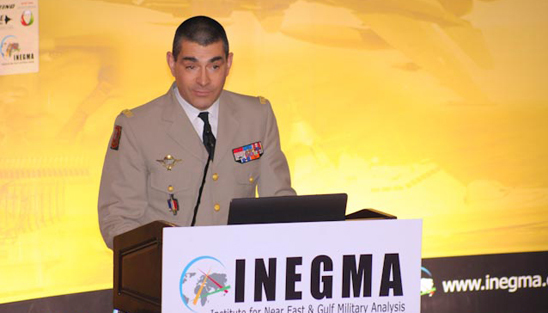 The UAE military reflects the modernity and progress our nation has achieved on the national level - INEGMA is proud to have originated and to be based in the UAE with the objective of promoting international peace and stability." 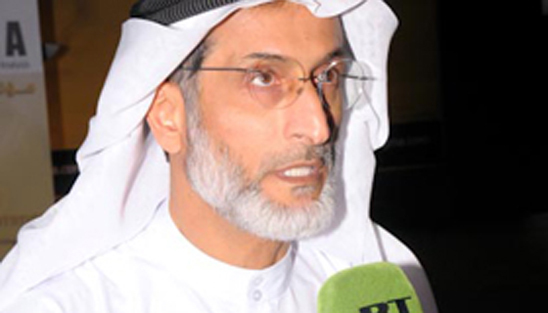 In the first keynote address, Major General Essa Saif Mohammed Al Mazrouei, Deputy Chief of Staff of the UAE Armed Forces, spoke on the industry importance and diplomatic significance of the GDC and IDEX: "As the official conference of IDEX 2011...the GDC has significant importance with the presence of the highest and most eminent security experts working on the national and international levels...These events have become central forums for scholars, elites and leaders in studying the modern defence landscape reflecting the wise guidance of Abu Dhabi's and the UAE's leadership and the close relationships of the UAE with its allies and partners." Gerald Howarth MP, UK Minister for International Security Strategy, delivered his vision for greater international cooperation and highlighted the enduring connection between Britain and the UAE during the second keynote address: "We in Britain want to build strong, reliable, and enduring strategic partnerships throughout the Gulf region – strengthening existing alliances, and promoting alliances with new, important allies...The United Kingdom has a long historical connection with the UAE, and with the Arabian Gulf more generally. Over many years, our bonds of friendship, understanding, and respect have grown and endured – through good times and bad." 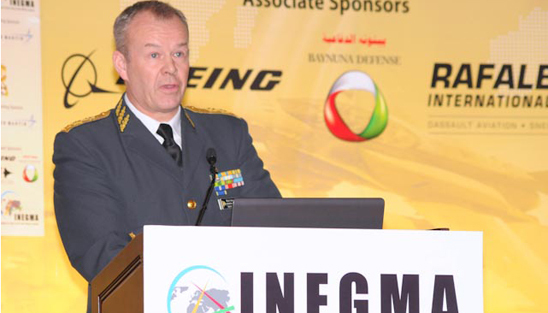 As the morning continued, the diplomatic tone of the keynote addresses shifted to focus on the role of modern technology within the evolving defence landscape. 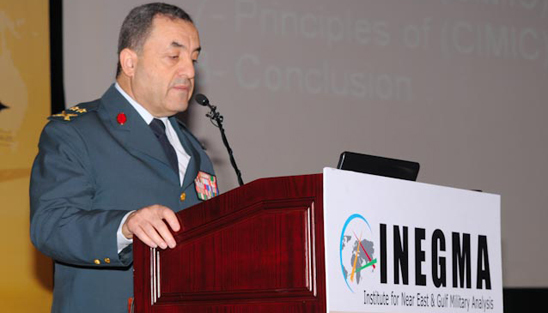 During the first plenary session chaired by His Excellency Major General (Ret.) 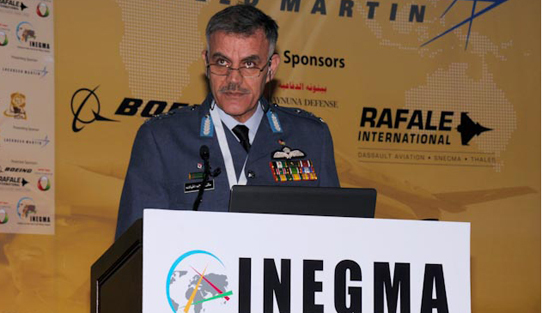 Khaled Abdullah AL Bu-Ainnain of INEGMA, panel speakers Lieutenant General Markku Koli, Chief of Staff, Finnish Defence Command; Major General Chawki El Masry, Chief of Staff, Lebanese Armed Forces; and Lieutenant General Bruno Kasdorf, Deputy Commander of the German Army, highlighted the central role advanced communications systems have come to play in modern defence while reinforcing the continued importance of traditional ground forces in future conflicts. 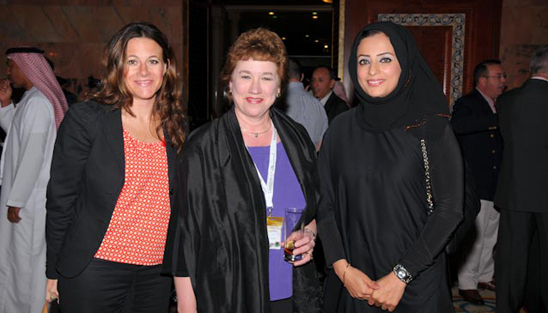 In addition, the issue of situational awareness and "plug and play" technologies are becoming more and more important. 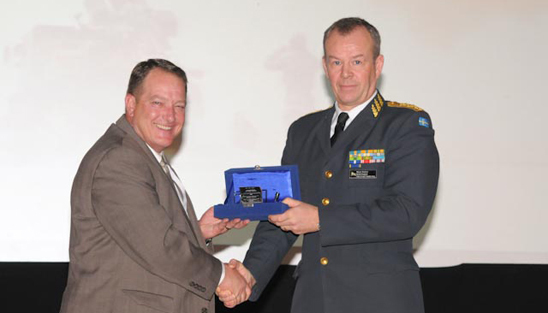 "For the past 2000 years, war fighting has been dominated by physics - by the number of troops and equipment," said Lieutenant General Koli. "Now militaries are moving beyond platform-centric operations as much of our aircrafts, tanks and ships have become much more dependent on integrated networks." 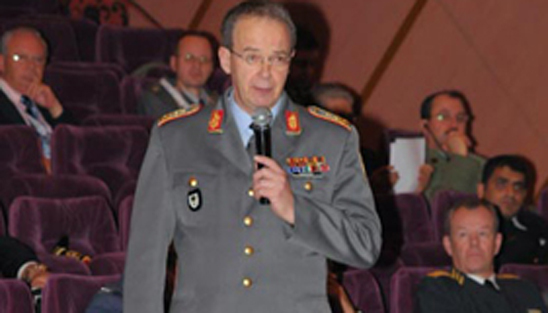 Building on this point, Lieutenant General Kasdorf reinforced the continued role ground forces will play in future defence operations and added, "I am convinced strategic [network-centric] communications will be one of the most important components of military operations in the future." 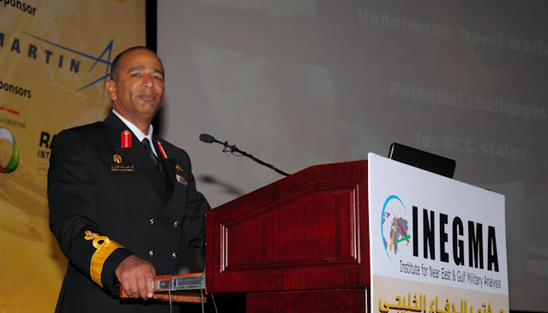 Moving from land defence to the naval theater, Dr. Theodore Karasik of INEGMA chaired the second plenary session with speakers Brigadier General Naval Staff Ibrahim Salim Al Musharrakh, Commander, UAE Naval Forces; Rear Admiral Charles Gaouette, Deputy Commander, Naval Forces Central, Commander, Fifth Fleet, United States; and Rear Admiral Davyd Thomas, Deputy Chief of the Royal Australian Navy. The speakers discussed the latest trends in regional naval defence including low intensity surface and underwater naval warfare; UAVs in sea operations for offensive and defensive missions; and harnessing new technologies for countermining operations. All of these activities are based on threat evaluation and threat evolution and the need for greater interoperability. 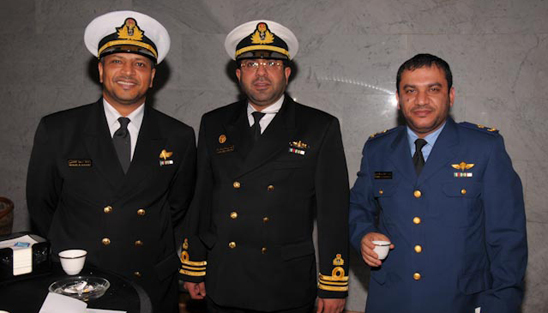 GCC naval interoperations that combine air, surface, and underwater operations is the ultimate desire. This would lead to a regional pool of deterrence. In terms of real-world operations, examples inc luding piracy and Pakistani flooding were described and analyzed in detail. 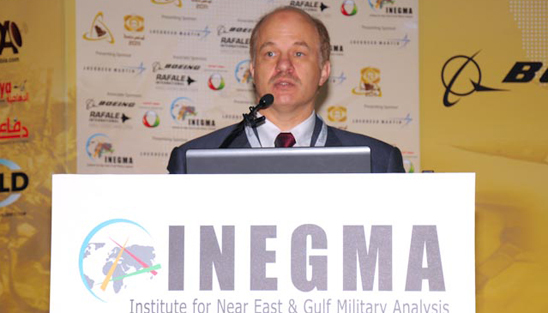 The final plenary session, chaired by Stan Green of Lockheed Martin, covered a range of topics increasingly relevant to the region including the growing role of ballistic missiles, their technical evolution and proliferation, as well as the significance of advanced armored vehicles and artillery are necessary in balancing the mobility and firepower of modernizing militaries. 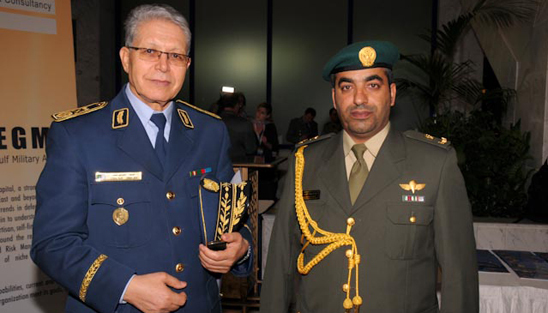 Speakers included Major General Malek Habashneh, Commander, Royal Jordanian Air Force; Major General Berndt Grundevik, Commander, Swedish Army; and Brigadier General (P) Eric Margail, DCOS for Employment and Support, French Land Forces.